Current Photos of 1960 Milby Grads - Photo Album: T) Melanie, Sandy and "The Stroll"
T) Melanie, Sandy and "The Stroll"
Melanie Winkler Morrison and Sandy Payne Bannister steal the floor and bring back great memories at the 45th Milby Class of 1960 Reunion. See the comment, "American Bandstand Turns 50" on the "Memories of Days Gone by..." post. 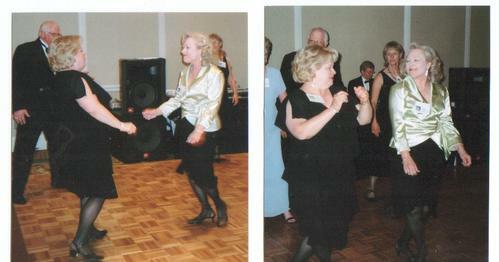 See other terrific photos of the reunion and the line dances on the 2005 Reunion Slideshow on the http://www.milbyclassof1960.org/ site.